Updating nutrition standards for snacks and beverages sold in school so that they meet the most recent Dietary Guidelines for Americans could help students maintain a healthy weight and support school food service revenue, according to a health impact assessment (HIA) released today by the Kids’ Safe & Healthful Foods Project and the Health Impact Project. The HIA found that updating national standards for the snacks and drinks sold in school vending machines, stores and à la carte lines would reduce students’ consumption of unhealthy items during the school day. 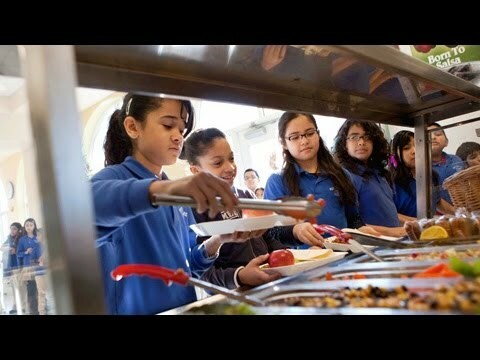 The study also found that consistent national guidelines likely would encourage more students to buy breakfast and lunch at school, providing schools with extra revenue. Students in lower-income communities and Black and Hispanic students would benefit from stronger standards, which is of particular importance because obesity rates tend to be higher among such students. Snacks and drinks sold outside of the school meals program are sometimes called “competitive foods” because they compete with school meals for students’ spending. These foods and drinks are currently required to meet only minimal nutrition standards. The U.S. Department of Agriculture is working to update these standards for the first time in more than 30 years. Based on their findings, the HIA authors recommend that the U.S. Department of Agriculture (USDA) establish comprehensive standards for all foods and drinks sold in school outside of the school meals program and help ensure effective implementation of these standards.